Collaboration can make the difference between organizations surviving and thriving! But to maximize the potential benefits to your organization and its clients, one must be prepared to give up some power and autonomy - a very small price to pay. Coalitions can be a low cost, high impact and enduring product of collaboration within closely related non profit organizaions. Part of a province-wide movement, the Early Childhood Development Coalition (ECDC) is Golden & Area A's best example of a coalition and it is coordinated by Joanne McCullough. Similar to coalitions, Community Sports Associations or Sports Councils are focussed on one sub-sector of the non profit community. 2010 Legacies Now offers 'Local Sport Council Development Program,' which could help Golden & Area A's sports organizations develop leadership through a community partnership in sport. 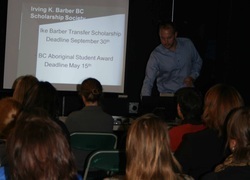 2010 Legacies Now is "piloting this program in more than six sites in B.C. by assisting local government to bring together community sport, parks and recreation leaders and health services organizations." Golden & Area A, through the work of GBRAC, has its backcountry lands divided into motorized and non-motorized areas. Within the non-motorized areas, the Golden Cycling Club, has developed many trails on either side of the valley and in their own tenure, the Golden Nordic Ski Club has created a world class facility. Snowshoeing trails are tenured at Kicking Horse Mountain Resort and private horseback riding trails dot the Columbia Valley. However, officially recognized (and legal) hiking trails are hard to find for locals and tourists alike. This lack of resources results in a lost economic opportunity as hikers head to more accessible and recognized paths in the neighbouring National Parks. In contrast, the Kootenay Columbia Trail Society manages 32 trails covering 170kms; including the Seven Summits Trail, an International Mountain Bike Association (IMBA) "Epic Trail." The Kootenay Columbia Trail network caters to hikers, mountain bikers, horse riders, cross-country skiers and snowshoeing throughout the Rossland/Trail area. The continued success and expansion of the Trail Network depends on the support of members and volunteers; corporate and public supporters; the regional district; private and corporate landowners. To better organize, plan and develop local non-motorized trails in Golden & Area A, the formation of a Trails Society, Trails Coalition or Trails Summit (meeting) could improve local recreation opportunities and drive economic development through increased tourism. Golden Community Resources Society (GCRS) appears to be the largest, by annual budget, social service-focussed non profit organization in Golden & Area A. With 15 full time equivalent staff (FTEs) and a budget of $1.2M it operates a number of lines of business, from Golden Employment Services to assisted living residences and many child care and resource programs. GCRS has many program faces in the community, with multiple phone lines and many office spaces, yet one bookkeeper, one Executive Director and one Board of Directors. GCRS has been also known to sponsor new groups that have yet to register either provincially or federally in order for them to access funding programs. The Golden Family Centre operates similarly to GCRS, but is smaller, with one location and unionized staff. Originally designed as the Town of Golden’s sports and recreation sign-up night, through a couple small government-supported grants, the Golden & District Community Foundation helped re-brand the evening as the Not For Profit Connection and invited all non profit groups (and even for profit recreation businesses) to set up a trade show-style display in the Mount 7 Rec Plex for one evening. The event has been scheduled the week after kids go back to school in September and regularly attracts 50 organizations and between 300 and 500 visitors. The main focus of the evening is to provide a free event for non profit groups to tell the public what they are up to and how to participate. Everyone, whether you are a new comer or local, leaves the evening learning something new about their community. One group was able to sign up over 150 participants in a 3 hour period with minimal advertising and limiting both paid staff and volunteer time. Some groups use the time to present a demonstration of their activity in the large gym, while others use it for fundraising.